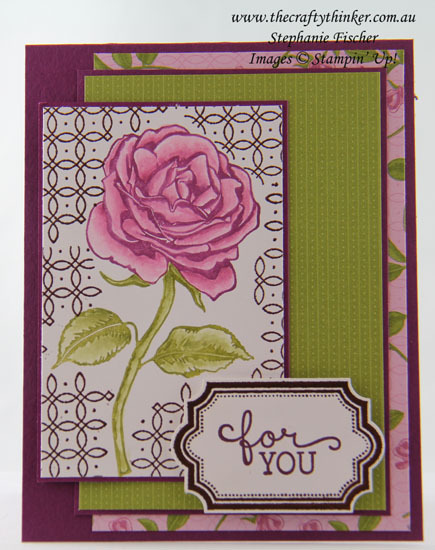 This is a great stamp set for producing a watercoloured rose quickly and easily. It's perfect for anyone feeling a bit daunted by watercolouring a flower too. The trellis and the label are copper heat embossed for a touch of glamour. 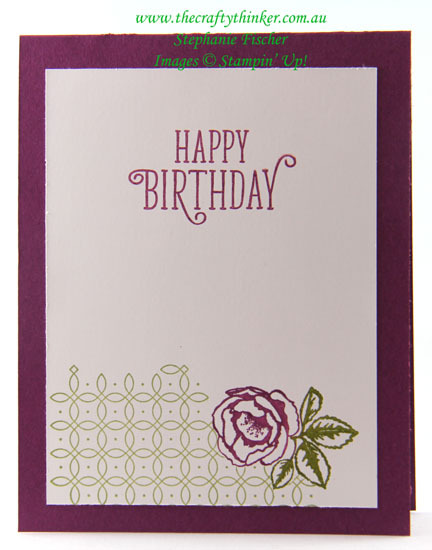 Greeting is from Birthday Blooms stamp set. To get a more natural effect, colour the stamp with Stampin' Write Markers so that you have green foliage and stem and the colour of your choice for the flower. I used Old Olive and Rich Razzleberry for this flower. 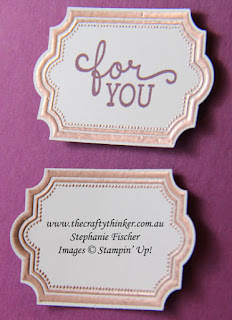 If you don't have markers, consider stamping in a neutral colour such as Basic Black or Crumb Cake. The flower will already look attractive and can be left at that - or you can add some more colour. 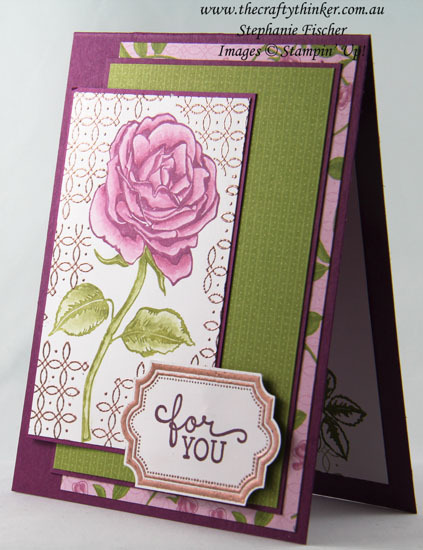 I used a damp brush and Sweet Sugarplum and Pear Pizzazz inks to fill in the flower. 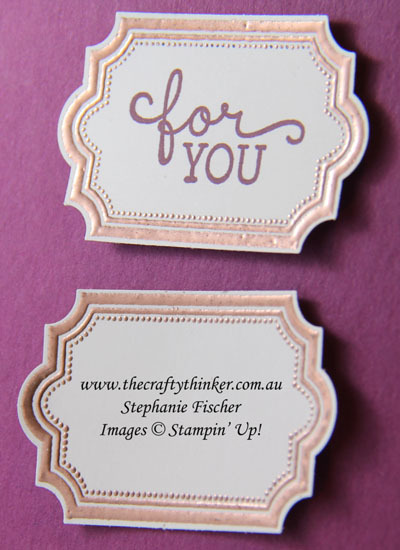 Tip: To maintain a crisp image, avoid brushing across the stamped ink so that you don't lift or disperse it. The advantage of Basic Black Archival ink is that, being waterproof, (once it's properly dry) you won't have to worry about colouring over it. Inside the card, I stamped the smaller flower in the same way but didn't colour it in. I masked it and then stamped the trellis pattern with Pear Pizzazz ink. I used Versamark to stamp only one of these two copper heat embossed labels - but which one?! Just as a little aside - can you spot the difference in the appearance of the copper heat embossing in these two labels? Neither could I! The top one is stamped with Basic Black ink and copper heat embossed and for the bottom one I used the usual Versarmark ink.